The great thing about Netflix is that you can jump on the online streaming service at any time to rewatch a movie or TV show. However, there are plenty of people who would prefer to own their favorite series on Blu-ray (especially as the picture quality is vastly superior, depending on how good your internet connection is). One Netflix show which users have been particularly vocal about wanting on Blu-ray is Marvel’s Daredevil. There’s been no word on any sort of physical release (even after season two started streaming earlier this year), but a listing on Zavvi.com appears to have spilled the beans on the first season of the critically acclaimed comic book adaptation finally coming to Blu-ray. The retailer lists the release date as October 3rd, and even has a couple of different versions available for pre-order. 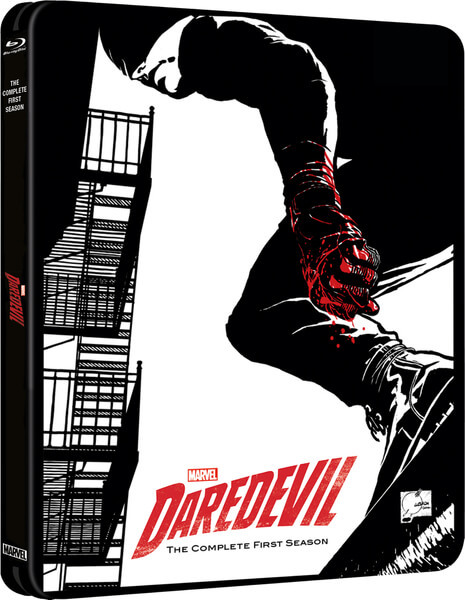 While those are subject to change, the fact that there is both a regular and Steelbook edition listed lends some weight to a Daredevil Blu-ray release actually happening rather than the date being added there by mistake. The best part about Daredevil hitting Blu-ray should be the special features, especially if they include episode commentaries and the like. Of course, the downside to this news is that the math points to us having to wait at least another year for Jessica Jones and probably a good eighteen months until season two of Daredevil. As a result, you may want to think about renewing your Netflix subscription if you hope to rewatch these shows in the near future.